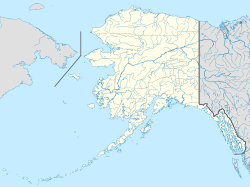 Akutan Island (Aleut: Akutanax̂) is an island in the Fox Islands group of the eastern Aleutian Islands in the Aleutians East Borough of Alaska. The island is approximately 18 mi (30 km) in length. The land area is 129.01 sq mi (334.13 km²). Mount Akutan volcano is located on it, which had a major lava eruption in 1979. The island's population was 1,027 (2010 census). All resided in the city of Akutan, near the island's eastern end. Akutan is an Aleut name reported by Capt. Pyotr Krenitsyn and Mikhail Levashev in 1768, and spelled Acootan by James Cook in 1785. This name may be from the Aleut word "hakuta" which, according to R. H. Geoghegan, means "I made a mistake." The Akutan Zero, a Japanese Zero aircraft, was named for the island after it crashed there during World War II and was recovered by the United States military.